This article is about camping. For the content management system, see Campsite (software). "Campground" redirects here. For the American historic district, see The Campground. "Camp ground" redirects here. For the American historic church, see Camp Ground Methodist Church. For the community in Illinois, see Camp Ground, Illinois. 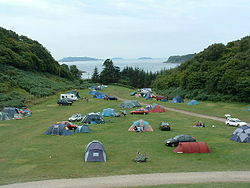 A campsite or camping pitch is a place used for overnight stay in an outdoor area. In UK English, a campsite is an area, usually divided into a number of pitches, where people can camp overnight using tents or camper vans or caravans; this UK English use of the word is synonymous with the US English expression campground. In American English, the term campsite generally means an area where an individual, family, group, or military unit can pitch a tent or park a camper; a campground may contain many campsites. an impromptu area (as one might decide to stop while backpacking or hiking, or simply adjacent to a road through the wilderness). a designated area with improvements and various facilities (see below). The term camp comes from the Latin word campus, meaning "field". 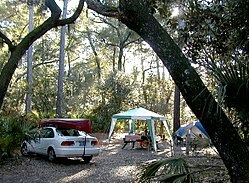 Therefore, a campground consists typically of open pieces of ground where a camper can pitch a tent or park a camper. More specifically a campsite is a dedicated area set aside for camping and for which often a user fee is charged. Campsites typically feature a few (but sometimes no) improvements. Camping outside a designated campsite may be forbidden by law. It is thought to be a nuisance, harmful to the environment, and is often associated with vagrancy. However some countries have specific laws and/or regulations allowing camping on public lands (see Freedom to roam). In the United States, many national and state parks have dedicated campsites and sometimes also allow impromptu backcountry camping by visitors. U.S. National Forests often have established campsites, but generally allow camping anywhere, except within a certain distance of water sources or developed areas. Camping may also be prohibited in certain ‘special areas’ of national forests containing unusual landforms or vegetation. And if conditions allow campfires, a campfire permit is required for campfires outside of developed campsites. In Britain, it is more commonly known as wild camping, and is mostly illegal. However, Scotland has a relaxed view and wild camping is legal in the majority of Scotland. In many parts of Canada, "roughing it" is considered to be wilderness camping on government owned, public land known as crown land and commonly called "the bush". There are no amenities of any kind and typically no development except for possibly logging roads or ATV trails, and few rules beyond the requirement in some provinces to move the site at least 100 metres every 21 days. In North America many campgrounds have facilities for Recreational Vehicles and are also known as RV parks. Similar facilities in the UK are known as Caravan Parks. The Kampgrounds of America (KOA) is a large chain of commercial campgrounds located throughout the United States and Canada. Many travellers prefer to use KOA, or similar campsites, as an alternative to hotels or motels. Both commercial and governmental campgrounds typically charge a nominal fee for the privilege of camping there, to cover expenses, and in the case of an independent campground, to make a profit. However, there are some in North America that do not charge a use fee  and rely on sources such as donations and tax dollars. Staying the night in a big-box store parking lot is also common (called " boondocking"), and some retailers welcome RVs to their parking lots. Some RV parks provide year-round spaces. Frequently confused with campsites, campgrounds and RV parks, trailer parks are made up of long term or semi-permanent residents occupying mobile homes, park trailers or RVs. The holiday park is a United Kingdom version of the North American trailer park. Created to allow coastal resorts to enable temporary and high-income accommodation to be easily created, under UK planning laws, no residents are permanent, and the park must be wholly shut to all for at least two months each year. All of the mobile homes are either available for rent from the land owner, or pitches are leased on a long-term basis from the land owner and the lease's own mobile home placed on the pitch. Permanent sites owners lease includes the provision by the land owner of water, sewerage and general site and grounds maintenance. Some holiday parks includes a small campsite for those touring the area, where they can pay to pitch tents or site touring caravans and motorhomes. Touring campsites have full access to the Holiday parks facilities, including clothes washing and showering. Most holiday parks include a central entertainments block, which can include a shop, restaurants, and a multi-purpose theatre used for both stage and activity-based entertainment. Holiday parks vary in size and type, as do the kinds of accommodation available within them. Caravans are a popular choice with holiday makers, and modern varieties come complete with features like double glazing and central heating, cookers, fridges, showers, hot/cold water supplies, electricity and gas mains input. A standard caravan is a single unit, built to a maximum of 14 feet wide. Other types of mobile home include Lodges and Park Homes which are more expensive than caravans and offer more luxurious features. Higher end Lodges can be built using some of the same methods as traditional bricks and mortar buildings and include familiar materials like plasterboard and tongue and groove walls for an end result that’s very similar to a standard house. A standard lodge uses similar materials as a standard caravan such as wood, gypsum board and plywood where the main difference being the extra width. Lodges and Parkhomes can come in sizes up to 22 feet wide and 45 feet long, making them a popular choice with big families and large groups. Certificated & Certified Locations are smaller privately owned caravan sites which have to be approved by the UK based Camping & Caravanning Club and The Caravan Club (and other organisations). These campsites are normally reserved exclusively for Club members. These smaller campsites are allowed to operate under The Public Health Act 1936 and The Caravan and Control of Development Act 1960. In the U.S., backcountry camping is common in large undeveloped protected areas. These areas can only be reached on foot, bicycle, canoe or on horseback. The camping areas are usually established campsites or "zones", which have a predetermined maximum number of persons that are allowed to stay in the section per night. Strict regulations are imposed regarding food storage and resource protection. Usually in organized parks or wilderness areas, backcountry campsites require a permit, which may be free, obtainable at visitor centers and ranger stations. Dispersed camping in other areas may not require a permit. As with camping, campgrounds predated the automobile. When President Theodore Roosevelt addressed Congress in 1901, he called for the creation of free campgrounds on Federal lands. Already four national parks—Yellowstone, Sequoia, Yosemite, and Mount Rainier—were established and by the time Congress formally established the National Park Service in 1916, America had a dozen national parks. The campgrounds themselves also changed. Martin Hogue wrote, “The first public campgrounds in the United States were nothing more than large, dedicated clearings, free of trees, within which to concentrate groups of tourists.”  A plant pathologist named Emilio Meinecke, was commissioned to study the effect of motor tourism in the Redwoods in 1929. Meinicke's recommendations explained that instead of allowing campers to park haphazardly within a park, the camper's impact on the environment could be minimized through campground roads forming a one-way loop leading to individual parking spurs next to each campsite. Although he would later continue to write of the effect of campers on nature, submitting a memorandum to the National Forest Service in 1935 entitled “The Trailer Menace,”  he had established the basic design for campgrounds still used today. ^ "Freecampsites.net - Directory of free and nearly free RV camping locations". Retrieved 2010-11-27. ^ "Walmart Frequently Asked Questions". Retrieved 16 Aug 2016. ^ "Find and buy holiday homes, parks and holiday in the UK with Parklink". Parklink. Retrieved 2018-10-22. ^ Roosevelt, Theodore (1901). "Extracts from President Roosevelt's Message to the Congress". Science. 14 (363): 907–912. doi: 10.1126/science.14.363.907. JSTOR 1627679. ^ Woodall, R. A. (April 1937). "The Trailer Park of 1937: Good Parks were Rare in 1936--This Year Promises Improvement". Trailer Travel Magazine. 2 (4): 26. ^ Dixon, Karl Hale (June 1937). "On and Off the Trail with the Editor: What Constitutes a Modern Trailer Park". Trailer Travel Magazine. 2 (6): 10–11. ^ Sweeney, Al J. (June 1937). "Trailer Park Growth Now on a Huge Scale". Trailer Travel Magazine. 2 (6): 15–17. ^ Hogue, Martin. "A Short History of the Campsite". Places. Retrieved 25 April 2015. ^ Meinecke, Emilio Pepe Michael (1929). "A Report upon the Effect of Excessive Tourist Travel on the California Redwood Parks". Sacramento. Retrieved 18 April 2015. ^ Meinecke, Emilio Pepe Michael (April 1, 1935). "The Trailer Menance" (PDF). Retrieved 18 April 2015. Look up campsite in Wiktionary, the free dictionary. 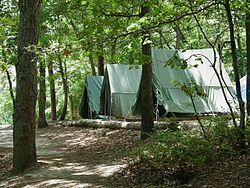 Wikimedia Commons has media related to Campsites.